Christine “Critty” McClendon was born on October 26, 1963 To Bettye L. McClendon. As a child and teenager she loved interacting with family and friends. She attended Hartshorne, Oklahoma Public Schools and graduated from Hartshorne High School in 1981. She developed a desire to teach and work with children from babysitting while in her teenage years of high school. After graduating she attended Eastern Oklahoma State College in Wilburton, OK, and East Central University in Ada, OK where she earned her Bachelors Degree in 1987. After graduation she moved to Denver, CO where she started her career in teaching special education. After furthering her education at the University of Northern Colorado she earned her degrees in School of Education and Human Development, Admin Leadership Studies and Principal/Admin License I, II, III and IV. She retired from Denver Public Schools on October 31, 2018 from the position of Program Manager. 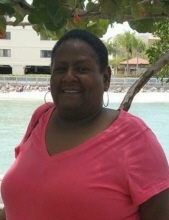 Critty is preceded in death by her mother, Bettye McClendon; sister, Cynthia McClendon; special nephew, Steven Neighbors and a special uncle, Lee Smith. She leaves to continue the celebration of her life her sisters, Deborah Neighbors and Mary Beth Neighbors; brothers, George McClendon, Jerome McClendon, Vance McClendon (Lisa) and Rodney McClendon; special aunt, Mary Santa-Cruz Smith; special nieces, Mackenzie Holt, Kirby Smith and Tasha Kusnir; special nephew, Jarred Holt and special friends, Courtney Leyba and Tom and Sue and Felicia Arnhart and a host of other nieces, nephews and a host of cousins relative and friends. To send flowers or a remembrance gift to the family of Christine McClendon, please visit our Tribute Store. "Email Address" would like to share the life celebration of Christine McClendon. Click on the "link" to go to share a favorite memory or leave a condolence message for the family.